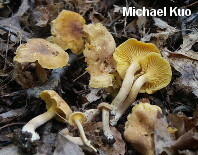 Cantharellus appalachiensis is an apparently eastern species of chanterelle, easily recognized by its brownish cap and stem. 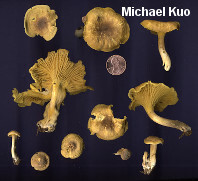 It is fairly evenly brown when young, but yellow and yellow-brown shades soon begin to dominate, leaving a brownish spot in the center of the cap at maturity. 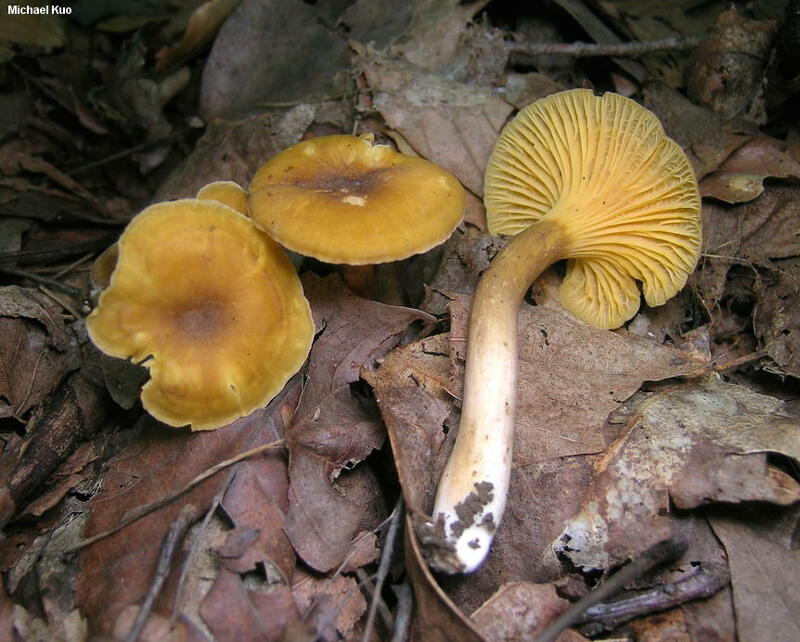 The undersurface has well developed false gills that are yellow from youth to maturity. 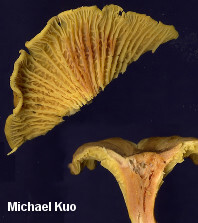 Cantharellus appalachiensis stains dull red on the flesh and the undersurface when a drop of iron salts is applied (see the page on testing chemical reactions), and is apparently the only North American species of Cantharellus to do so; other species demonstrate a negative to purplish gray or gray reaction. Despite its name, Cantharellus appalachiensis appears to be distributed throughout eastern North America. Ecology: Mycorrhizal with oaks and other hardwoods; growing alone, gregariously, or in small clusters; summer; apparently widely distributed east of the Great Plains. The illustrated and described collections are from Pennsylvania, Kentucky, Indiana, and Illinois. 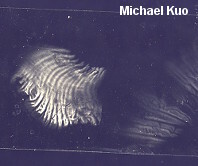 Cap: 1.5-6 cm across; convex with an inrolled margin at first, becoming broadly convex, flat, or shallowly depressed, with an inrolled, uplifted, or irregular and wavy margin; the disc not becoming perforated; bald or nearly so; often somewhat wrinkled, especially over the center; moist when fresh but soon dry; brown overall at first, but soon developing yellow undertones and eventually becoming yellowish brown to yellowish, with a brown spot over the disc. 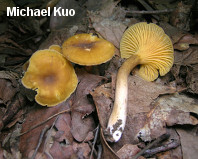 Undersurface: With well-developed, closely spaced false gills that run down the stem; yellow throughout development; often developing cross-veins with maturity. Stem: 2-6 cm long; 3-11 mm thick; fairly slender; equal, or tapering downward; bald; brownish to brownish yellow or yellow; fleshy but becoming partially hollow at the core; basal mycelium white. Flesh: Whitish to yellowish; unchanging when sliced. Odor and Taste: Odor fragrant, reminiscent of apricots; taste not distinctive. Chemical Reactions: Iron salts dull red on flesh and undersurface. Spore Print: White to creamy. 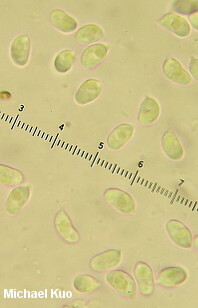 Microscopic Features: Spores 6-9 x 3.5-5 µ; ellipsoid; smooth; inamyloid; ochraceous in KOH; with minutely granular contents. Basidia 45-65 µ long; 4- 6-sterigmate. 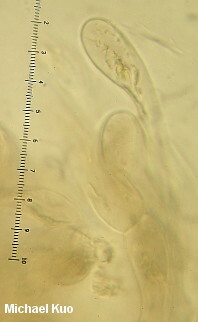 Elements from cap surface 5-12.5 µ wide; hyaline to brown in KOH; smooth; septate; clamped; terminal cells clavate to subclavate, thin-walled. REFERENCES: Petersen, 1971. (Bigelow, 1978; Smith, Smith & Weber, 1981; Roody, 2003; McNeil, 2006; Kuo, 2007; Binion et al., 2008; Kuo & Methven, 2014.) Herb. Kuo 07079402, 07010303, 07140312, 07220301, 07010801, 07210905, 07091101.